Click the asterisk to learn how old are Lector's Notes. After decades in exile in Babylon, Jews returned to Jerusalem. After months of rebuilding, they pause for a celebration. The festivities begin with a morning-long reading from the book of their covenant with God, which they had forgotten. Christians in Corinth had a variety of spiritual gifts or charisms, the special powers named in last Sunday's reading. Paul wants each to use his or her gifts generously, for the benefit of the whole community. So he compares the individuals in the church to the parts of single body. Now we hear the introductory paragraph of Saint Luke's gospel. Luke addresses the book to one "Theophilus," a name which means "lover of God." There follows Luke's first description of Jesus' teaching. Our Liturgical Setting: In this liturgical year, our gospel passages will be from Saint Luke. Today's gospel, Luke1:1-4; 4:14-21, consists of Luke's introduction to his whole work, followed by Jesus' first preaching. That preaching, most interestingly, consists merely of a reading from the prophet Isaiah and the simple statement, "Today this Scripture passage is fulfilled in your hearing." Today's first reading, as usual, is chosen to prepare us to hear the gospel. The Historical Situation: The context is this. The Babylonians had conquered Judah and dragged many of its people away into slavery, a period known as the Exile or the Babylonian Captivity. When the Exile ended, the captives were freed and allowed to rejoin their left-behind compatriots. The most important of these reunions was in ruined Jerusalem, where the people set to restoring things as best they could. After several months of work under leaders named Ezra and Nehemiah, the people pause for a celebration. So, do they launch fireworks? Do they pop chilled bottles of champagne? Do they cook the fatted calf or throw some burgers on the grill? Well, first they spend all morning listening to the Law, also known as the Torah, the Covenant, and the Word of God! They weep with joy for hearing it. Then they go off to eat and drink, sharing their food with the poor. Proclaiming It: What's the situation and the mood here? The people are profoundly grateful that things are getting back to normal after a long period of turmoil and uncertainty. In modern terms, imagine the first Christmas in the family of a returned prisoner of war. Or the first sit-down meal in a home after flood waters have receded and the cleanup is nearly finished. That's the feeling you should try to capture in your proclamation. As lector, be sure your congregation understands that it's The Law that Ezra is reading to the people. That expression comes early in the first sentence. If you're hasty and the congregations hasn't settled in their seats, they'll miss that phrase. If you habitually build your volume slowly as you pronounce a sentence, this phrase will get lost. Emphasize the words "read," "book," and "scroll." The Historical Situation: Among the Christians living in the Greek seaport Corinth, there were diverse manifestations of the gifts of the Holy Spirit. Prophets, preachers, healers, teachers, you name it, the Spirit bestowed the job on someone there. These folks often exercised their gifts in spectacular, ecstatic ways that drew a lot of attention, as they do today among people who attend revivals and the crusades of some faith-healers. Paul spends chapters 12, 13 and 14 of this letter trying to get the Corinthians to enjoy and express their gifts in ways that give strength to the community and glory to God. For the natural tendency of some of the supernaturally endowed was to glorify themselves with their God-given power. The Theological Background: So why does Paul care so much about the Corinthians' use of the spiritual gifts? It's his goals: The unification of the church by the humbling of all members, the squelching of their rivalries, and the re-direction of their efforts to mutual service and mission. Proclaiming It: Understand that, and make those your own goals, and you'll proclaim the reading properly. This particular passage tackles the unity-of-the-church issue with the metaphor of the parts of the body. Everyone in the church is compared to a part of the body, making his or her unique contribution to the health of the whole. If you read the long form, you'll notice it's a bit tedious, and it ends abruptly. But it's such an important lesson, you shouldn't let these structural factors obscure the meaning. So make up your mind to read it with a variety of expressions, with contrast in your voice, with appropriate pauses. Of all the gifts of the Spirit, you're the only one exercising the office of lector in your assembly this Sunday. 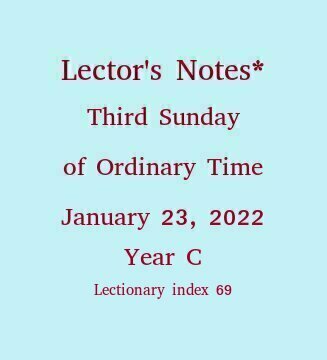 * The first Lector's Notes appeared on the Web January 23, 1999, for the Third Sunday of Ordinary Time in liturgical year A. The website lectorprep.org appeared in November, 2002. It now serves pages covering 180 of the Sundays and feasts in the three-year liturgical cycle. Volunteers have translated some Notes pages into Spanish. Most Notes pages are now mobile-friendly. 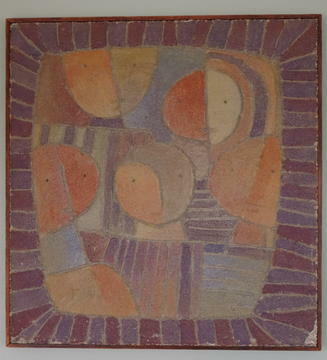 Untitled fresco by Brother Mel Meyer, S.M. (American, 1928-2013). 1973 gift to the author from The Reverend Richard L. Chiola.